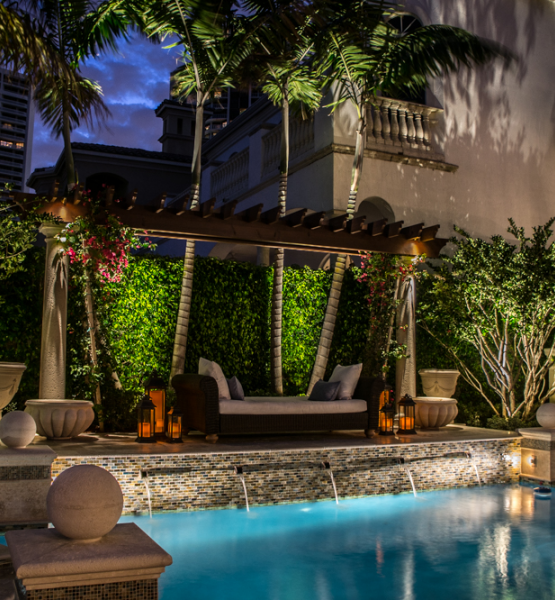 Years of experience have enabled the design professionals at Yard Sentry to become the masters of outdoor luminescence. Harnessing the brilliant power of light, our company’s emphasis on design has become the standard of excellence within our industry. It matters little what scale we work on, as residences and businesses of any size benefit from the artistry of our expert designers. Continuously exploring new ways to creatively harness light, we’ve built an extensive portfolio of inspiring images. Each custom project is a work of sheer beauty, creating spectacular outdoor theater for everyone within the line of sight of our work. If you want to capture the transformative magic of light, we welcome your call. At our very first meeting you will see why we have become the leader in our field. Yard Sentry light installations immediately add value to your home or business and elevate your property above the ordinary - adding layers of luminous beauty, depth and dimension every time that day turns to night. Long before it became a cause célèbre, Yard Sentry was environmentally conscious, continually investigating and employing "green solutions" wherever possible. Today we offer an entire line of LED products and LED bulbs for both indoor and outdoor use. In fact, we are proud to be one of the few sources within our industry to create custom designs using LED fixtures. Just wanted to commend you on the great service you provide. We have had our lighting installed for a decade now. Always in great shape due to your crews care. As a homeowner I deal with lots of services. None has constantly provided the high level of great support as yours. Thanks for a job well done.